A row has broken out over the attendance of three of Britain's governing Labour Party MPs, including the high-profile Goan-origin Keith Vaz and Ealing Southall's new representative Virendra Sharma, at a several-thousand-strong expatriate Tamil event to pay their respects to those who died in the "Tamil liberation struggle". The Sri Lankan High Commission here has protested at Vaz's attendance, describing it as an act that shows he is "partisan to a proscribed terrorist group". Vaz currently chairs the influential parliamentary Home Affairs Select Committee, which has oversight of Britain's counter-terrorism laws. The LTTE, referred to by the Sri Lankan authorities, is proscribed in Britain. Under the UK Terrorism Act, the Tigers are banned from raising funds, holding property or operating in any form and it is an offence to glorify their activities, or incite others to support them. The Sri Lankan High Commission claimed the event was organised by apologists for terrorists, and more particularly, by "a front organisation of a terrorist group for fundraising and propaganda purposes". But according to Tamilnet, which describes itself as "a news and feature service that focuses on providing reliable and accurate information on issues concerning the Tamil people in Sri Lanka", the "over 25,000 expatriate Tamils in Britain...gathered to mark 'Tamil Remembrance Day' to pay their respects to those who had died in the Tamil liberation struggle. The event (was) organised by Tamil National Remembrance Foundation, an association of families of Tamils who had fallen in the Tamil struggle". 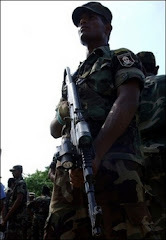 Tamilnet said the annual event, which saw its largest attendance ever, was particularly relevant in the context of the "resumed conflict in Sri Lanka". The gathering row over the attendance of high-profile British Asian MPs came after it became clear LTTE leader V Prabhakaran's so-called 'Heroes Day' address was broadcast live on large screens across the south-east London venue, with Vaz, Sharma and another Labour MP Joan Ryan in the audience. The Sri Lankan authorities are understood to object to the MPs' presence at an event used by Prabhakaran to call for "the entire Tamil-speaking world to rise up for the liberation of Tamil Eelam" and praise the LTTE's use of suicide bombers with the words: "The immeasurable dedication and sacrifice of our heroes is delivering a message to the Sinhala nation." But Vaz, who jointly chairs the All-Party Parliamentary Group for Tamils with Liberal Democarat MP Simon Hughes, who sent a message to the rally, insisted he was "not really interested in (the contents of Mr Prabhakaran's speech). I was there to deliver a message from the all-party group, which is what I do. I was there to deliver a message from my constituents. I have many Tamil people in my constituency." He and his party colleague Ryan said they had been unaware Prabhakaran was due to speak, a defence described as ludicrous by observers who said the LTTE hierarchy's rallying calls are standard procedure for a rally such as this. At every previous 'Heroes Day' commemorated in the UK, Prabhakaran's speech has been televised to rapt audiences.